Upholstery is an integral part of your home and office aesthetic. Aside from the element of style that it can add to an area, upholstery is also inexpensive and versatile. Upholstery fabric can be used for different purposes and adds a luxurious flair to a formerly dull-looking piece. Like every household item, your valuable upholstery also needs tender loving care. 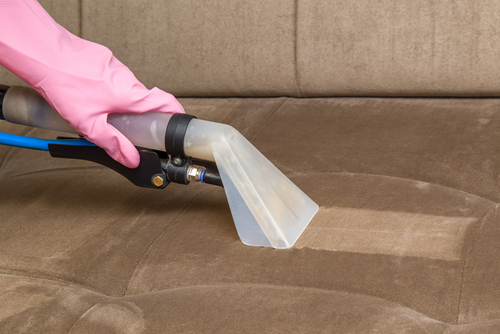 Here are five reasons why regular upholstery cleaning is important. Fresher look. Dirty upholstery is visually unappealing and may leave a negative first impression. In addition, the lackluster look can add years to your upholstery’s actual age. By thorough cleaning, your furniture can be brighter and better, looking like it just arrived! Dirt removal. Years of usage can cause dust and dirt to accumulate on your upholstery. Vacuuming alone cannot remove deep-seated grime that has long clung to its fibers. Seek the help of a professional to completely rid your stuff of dirt. Bacteria prevention. Liquid spillage and other accidents cna cause a result of bacteria growing and spreading on your upholstery. You wouldn’t want your family to be exposed to bacterial growth! Professional cleaning companies have the proper tools and products to remove and prevent bacteria on your upholstery. Improved air quality. With the dust and dirt that settle on your couches and sofas come particles that can trigger allergies once they contaminate the air. Having proper upholstery cleaning can help lessens these allergens and improve your home’s air quality, which can have significant benefits to your family’s health. Cost reduction. Regular cleaning and maintenance keeps your upholstery from serious damages and loss of structural integrity. This will keep it in good condition and allow a long life before a replacement needs to be purchased, which helps save you money in the long run. It would be beneficial and easier if you let a professional upholstery-cleaning company perform the job for you. Our experienced upholstery technicians at ServiceMaster of Savannah have the knowledge and skills to restore your upholstery’s former glory. We pride ourselves for our reputation and ability to deliver results that guarantee the satisfaction of our customers. ServiceMaster of Savannah has been in the business for over 40 years and this would not have been possible without our customers’ trust in what we do. For upholstery cleaning services in Savannah, Georgia, and its surrounding areas, contact ServiceMaster of Savannah at 912-244-6966. You can also visit www.servicemastersavannah.com to request for a FREE estimate.